P: Focus on the Plate method for meal planning – At the holiday celebration plan ahead to choose more fruits and vegetables. Fill half your plate with these foods and eat them first. Choose a smaller plate such as a salad plate to help with portion control. Research has shown that the more food we are served the more we eat. A: Appreciate family, friends, and memories - Appreciate those you are with, focus less on the food and more on the conversation which is calorie-free! N: Nutrition basics: Balance, Variety, Moderation – Balance calories for weight management by enjoying the food but eat less particularly with the many calorie laden holiday options. Make a healthy plate eating a variety of foods - vary choices within each food group to get an array of nutrients. 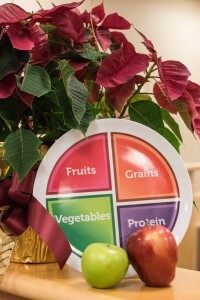 Check out http://www.choosemyplate.gov/food-groups/downloads/TenTips/DGTipsheet1ChooseMyPlate.pdf for tips to a healthy plate. Practice moderation with portions – YOU can choose to consume a little or a lot –enjoy the holiday treats but consume smaller portions, use a smaller plate and dish up appetizer-sized helping of each food. Eat Well this Holiday Season!